Summary: We describe our preliminary experience with the three-dimensional constructive interference in steady state (3D-CISS) sequence for the evaluation of intraventricular lesions. Cyst walls, extent and margins of tumors, and intratumoral cystic structures were clearly depicted on 3D-CISS images. The 3D-CISS sequence can offer additional information to conventional MR studies to define intraventricular lesions better. Although MR imaging is useful for the evaluation of intraventricular lesions, it may sometimes be difficult to determine lesion location, margin, and extent when using conventional MR techniques (1, 2). The three-dimensional constructive interference in steady state (3D-CISS) sequence can provide high-resolution images with excellent contrast between cerebrospinal fluid (CSF) and solid structures. Several investigators have used the 3D-CISS sequence to show the fine anatomic structures of the inner ear and the cerebellopontine angle (3–5). In this study, we describe our preliminary experience with the 3D-CISS sequence for imaging intraventricular lesions. Twenty-two patients with intraventricular lesions (18 patients with intraventricular masses and four with intraventricular cysts) were studied on a 1.5-T superconductive unit with a 25-mT/m maximum-gradient capability (Magnetom Vision; Siemens, Erlangen, Germany) and a standard head coil. For the 3D-CISS images, two 3D Fourier transform data sets were acquired with true fast imaging with steady-state precession (FISP) sequences, which included flow compensation applied to each gradient over each repetition-time cycle. One data set was acquired with an alternating radiofrequency pulse, and one was acquired with a nonalternating radiofrequency pulse. After conventional T1- and T2-weighted spin-echo (SE) imaging was completed, the 3D-CISS sequence was performed (parameters: 12.2/5.9/1 [TR/ TE/excitations]; flip angle, 70°; matrix, 192—256 × 512; field of view, 150—210 × 200–210 mm; in-plane resolution, 0.78 × 0.39 mm). An axial or sagittal 50-mm-thick slab with 70 partitions was used to cover the intraventricular lesions based on conventional T1- or T2-weighted images or both. Image acquisition time ranged from 5 minutes 2 seconds to 6 minutes 43 seconds. The phase-encoding direction was right to left for all patients. In all cases, 3D-CISS sequences could produce homogeneous images over the entire field of view and high contrast between the CSF and solid structures. The thin wall of the cysts and small cystic components in the tumors were clearly shown on 3D-CISS images (Figs 1 and 2). The tumor margin and dissemination of the tumor were also clearly visible on images obtained from 3D-CISS sequences (Figs 3 and 4). 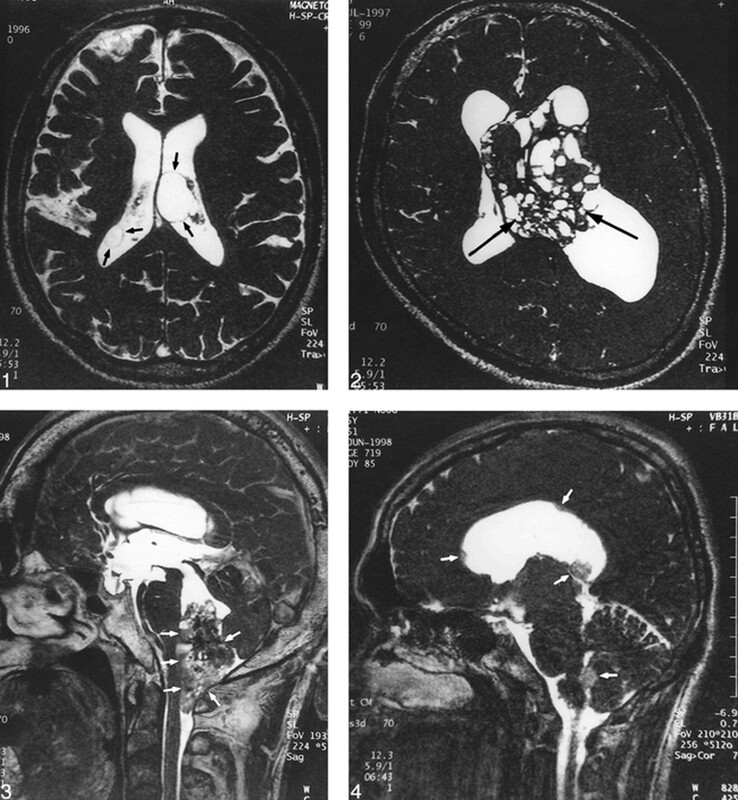 A 70-year-old man with intraventricular cysts in both lateral ventricles. The cyst walls (arrows) are clearly depicted on this 3D-CISS image. fig 2. A 28-year-old man with central neurocytoma. Many small cystic components (arrows) are clearly visible within the tumor on this 3D-CISS image. fig 3. A 51-year-old man with ependymoma of the fourth ventricle. A 3D-CISS sequence clearly shows the relationship between the tumor and adjacent structures (arrows), making determination of tumor origin easy. fig 4. A 25-year-old man with anaplastic astrocytoma. A 3D-CISS sequence depicts multiple dissemination (arrows) in the ventricles. To evaluate the anatomic location of an intraventricular mass lesion accurately, an image with high resolution and high contrast between CSF and solid structures is necessary (2). In general, it is impossible to acquire sections thinner than 3 mm with the 2D-SE technique. Recently, improvements in gradient strength and profile have allowed the capability to obtain much thinner sections, but it sometimes causes prominent signal loss in the CSF due to a washout phenomenon (6). For this reason, the thinner-section 2D-SE scans would not be favorable for imaging the ventricular system. The 3D-CISS MR sequence is specifically designed for MR cisternography. The 3D-CISS sequence has two data sets with a true FISP sequence of alternating and nonalternating radiofrequency pulses. Although the FISP sequence produces artifacts of low signal intensity bands that are caused by very small magnetic field inhomogeneities and local field distortions (susceptibility changes), the position of the dark bands is shifted in the second data set to the position of high intensity of the first data set. Thus, the 3D-CISS sequence is an effective method of reducing these dark bands by the summation of two flow-compensation 3D-FISP sequences, and produces an image with homogeneous intensity distribution over the whole image and excellent contrast between CSF and solid tissue (3). The 3D-CISS sequence has several advantages over conventional MR imaging. First, the thin contiguous sections and high in-plane resolution make it possible to depict small structures or lesions, such as intraventricular CSF dissemination and the thin wall of a cyst. Second, any desired imaging plane could be obtained by multiplanar reconstructive technique. For example, the reconstruction images can easily depict a relationship between the lesion and important structures such as the foramen of Monro or aqueduct. Third, the 3D-CISS sequence may be used to evaluate intraventricular solid masses after contrast enhancement. A previous study has reported that the contrast between the cranial nerves and acoustic tumors increases after gadolinium administration, whereas the contrast between CSF and tumor remains (7). Finally, we believe that the 3D-CISS sequence could be added to the MR examination of the intraventricular system for patients with a contraindication to receiving contrast material. The 3D-CISS sequence enables the examiner to obtain high-resolution and heavily T2-weighted 3D images in a relatively short imaging time for diagnosis of intraventricular lesions. ↵1 Address reprint requests to Yukunori Korogi, MD, Department of Radiology, Kumamoto University School of Medicine. 1-1-1 Honjo, Kumamoto 860-8556, Japan.